Rare Opportunity to Buy Award-winning Children’s Music Education Franchise in Premium location. Own the hot "Songs for Seeds” music education franchise on the wealthy Upper East Side of Manhattan NYC (or relocate to your own neighborhood!). Plus, get the franchise for nearly 40% off! Franchise comes with all the tools (equipment, curriculum, props, training, and an awesome franchisor) to run this successful children’s music business. No real estate to buy! Seller Financing for qualified buyers. 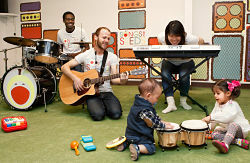 Named "Best Music Class” by New York Magazine and "Most Magical Music Class" by Red Tricycle, Songs for Seeds is a rockin' music program that encourages children newborn to 6 years old to sing, dance and play along with a live, three-piece band. Kids play children's instruments, as well as real drums, guitars, keyboards and diverse instruments from around the world during each 45-minute weekly class. By mixing original kids rock 'n' roll with top 40 and classic hits, Songs for Seeds is pleasing little ones, as well as their grownups, all across the country. Songs for Seeds is a now one of the nation’s hottest music education franchisors – with franchisees in New York, Texas, Seattle, North Carolina, Florida, among other places. Don’t miss this chance to own a business that gives you personal flexibility, support from a great franchisor, and an easy-to-run business model. "“After coming to meet the founders and seeing songs for seeds, my husband and I knew that this was the business for us. We LOVE both children and music, and wanted to give as many kids as possible an early exposure to music. We are so excited to be joining the larger songs for seeds family and to bring this awesome program to Seattle." Franchisee. "I met with the founders and we hit it off right away. They were also working moms who decided to leave corporate and start a business. I’m still busy but I make my own hours so the flexibility has been a tremendous step in the right direction for me. I hope this story can show that it really is possible to “have it all," family + career.” Franchisee. To find out more about this Songs For Seeds franchise for Sale please fill in the form below and submit.